Batting practice ended at 5:20 Tuesday afternoon, however, no one informed the Tampa Bay Rays, who punished Edwin Jackson and the San Diego Padres for 10 extra base hits, including five home runs. When all was said and done, Tampa Bay pummeled San Diego, 15-1. The Rays have now scored 35 runs over the last three games (a franchise record for a three-game stretch) and have won three in a row. Tampa Bay began the onslaught in the second inning against former Ray Edwin Jackson, when Luke Maile ripped a bases-loaded double down the left field line, clearing the bases for a three-run advantage. They continued to pile on the runs in the third inning, scoring four times off the hurler that notoriously threw a 2010 no-hitter against the Rays at the Trop. Evan Longoria started the frame with a triple to right (his 60th extra base hit this year). After Brad Miller went down swinging, Matt Duffy reached on an infield hit. Logan Morrison, who’s been on fire since returning from the DL on Monday, doubled into the right-field corner, plating a pair of runs. And though Steven Souza Jr. flew out to center for the first out of the frame, Corey Dickerson extended the inning by working a seven pitch walk, bringing Maile to the plate. Maile — who entered the game with five RBI in 19 games, and ended the night with nine on the season — and Nick Franklin went back-to-back with singles, capping the rally. 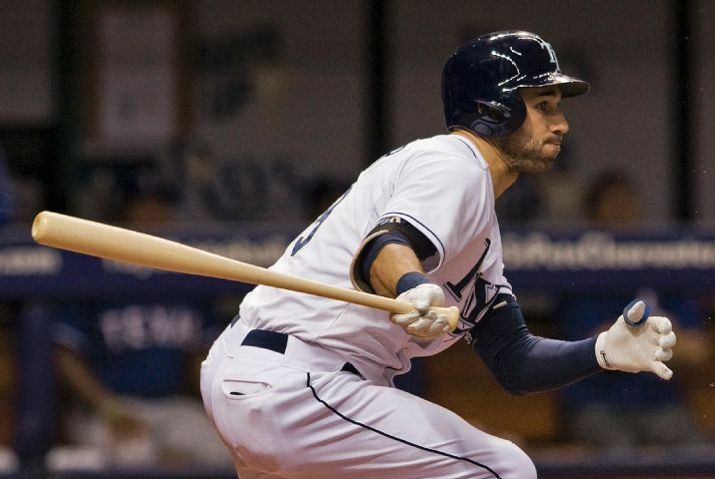 The Rays continued to shellack San Diego in the fourth when Miller hit a massive 446 foot homer off the batter’s eye in center for an 8-1 lead. Franklin and Miller also combined for a pair two-run homers in the fifth inning off Carlos Villanueva to put the good guys up by 11. Franklin delivered three RBI after being penciled into the leadoff spot as a pregame substitution for Logan Forsythe, who was pinched due to back spasms. He’s also now hitting .250 BA/.313 OBP/.500 SLG/.813 OPS/.336 wOBA/.250 ISO over the second half of the season, with seven runs and 11 RBI. In the sixth inning, Corey Dickerson homered to give the Rays a 12-run advantage, and Evan Longoria notched his 27th homer this season in the seventh, capping the scoring. Longoria finished the night a double shy of the cycle, and matched Carl Crawford’s franchise record for games played (1,235). 15 runs and 10 extra base hits later, it only took the Padres eight innings to put the Rays down in order — San Diego’s only 1-2-3 inning of the night. The Rays will go for the sweep Wednesday afternoon when Chris Archer (6-16, 4.39 ERA) takes the mound opposite of Christian Friedrich (4-8, 4.84 ERA). Archer leads the majors in losses, including a five run/six inning outing against the Yankees last Friday. This will be his first start against the Padres. Friedrich signed with San Diego in March after being released by Colorado. He’s allowed 132 baserunners in 87-1/3 innings. You can read about the pitching matchup in our series preview. — Matt Duffy precautionarily left the game after the third inning with mild left achilles soreness. The newest Ray told reporters after the game that whether he plays in the series finale will be a game-time decision. — Update: As expected, neither Logan Forsythe nor Matt Duffy are in today’s lineup. Forsythe said the pain in his back is manageable but his rotation/mobility limited. He doesn’t expect to be available today, and aims to return Friday. As for Duffy, he said his Achilles is “sore” as expected after playing five straight games, but he is “not concerned.” The shortstop thinks it is part of healing process. — Alex Cobb and Chase Whitley update. Both hurlers took the mound Tuesday night in Durham and Port Charlotte (respectively). Cobb posted a four inning no decision with the Bulls, allowing three runs on two hits and three walks, on 76 pitches (46 strikes), while striking out five. With the Stone Crabs, Whitley scattered four hits (three infield singles) over six innings and 92 pitches (67 strikes), fanning six. — If the breaks don’t break you, and the takes don’t take you… The Rays enter Thursday’s ballgame with a 60 – 58 BaseRuns record, a 57 – 61 Pythagorean Expectation, and a .289 BABIP (which is just over MLB average). The thought that if a few more balls dropped in here or there, or if the team wasn’t decimated by early injuries, we’d have a contending ball club is rather maddening. Talk about bad luck. — Welcome back, Logan Morrison. 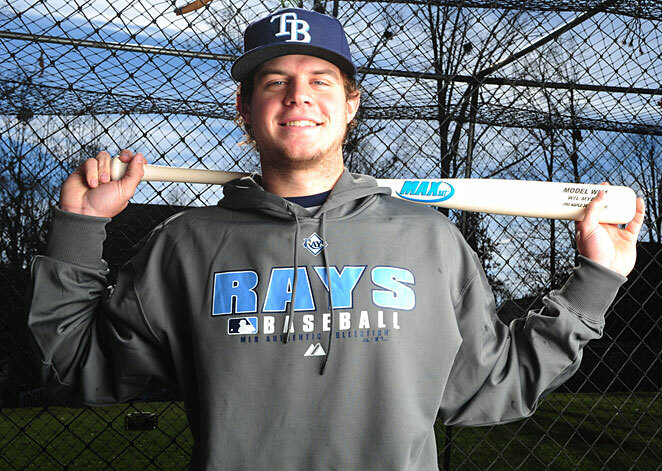 The Tampa Bay Rays announced that LoMo has been activated from the 15-day DL. In doing so, RHP Dylan Floro has been optioned back to Triple-A Durham. Morrison, who bats sixth as the DH tonight, said he’s good with Brad Miller’s move to first base, and is willing to help Miller any way he can. — We here at X-Rays Spex will be at the Trop in full force this upcoming Friday for the Baseball Forever Night at the Trop. By full force, I mean that a group of 13 tickets has been procured. If you’re still interested in attending the ballgame, single-seat tickets are still available at the Baseball Forever Night at the Trop website (linked). — You can read about tonight’s pitching matchup, and so much more, at our series preview. The Tampa Bay Rays return home from a 2-4 road trip to start a three-game, interleague series against Wil Myers and the San Diego Padres. The Rays are now home at the Trop for 10 consecutive games, while the Padres are wrapping up their road trip in Florida. Both teams just finished a stint in New York City, culminating in completely different outcomes in the series finale. San Diego was almost no-hit by Mets pitcher Steven Matz in a 5-1 loss on Sunday, yet the Rays salvaged a game in the Bronx with a 12-3 win against the Yankees. Evan Longoria continues to swing a hot bat, collecting three hits and four RBI on Sunday, in a game in which all nine Rays starters had hits and scored. We had a nice offensive approach and it was nice to see, said Rays manager Kevin Cash, whose team posted 21 runs in two wins last week, yet 15 in four losses. (Longoria) has been outstanding. His at-bats, his approach, everything he does. He’s a guy you want when guys are on base. Right now, he’s seeing everything really well. When I was in Tampa (Bay), I was young and dumb. I did a lot of things that weren’t great, as far as just being a big-leaguer. I’ve really felt like I’ve grown as a big-leaguer, grown as a teammate. That’s one thing I wish that I could’ve given Tampa (Bay). Cash will throw Drew Smyly (4-11, 5.04 ERA), Blake Snell (3-5, 3.18 ERA), and Chris Archer (6-16, 4.39 ERA) the next three days. Andy Green will counter with Luis Perdomo (5-6, 6.80 ERA), Edwin Jackson (3-2, 4.19 ERA), and Christian Friedrich (4-8, 4.84 ERA). Smyly tossed six innings of two run baseball on Tuesday, allowing six hits and three walks while fanning two Blue Jays. Smyly went 2-11 in his first 18 appearances of the season, with a 5.64 ERA and just six quality starts. He, however, has turned things around since the All-Star Break, making four consecutive quality starts and going 2-0 with a 2.52 ERA, and posting a 19/6 K/BB along the way. Snell allowed five runs (two earned) on five hits and four walks over just 1-2/3 innings on Wednesday. The southpaw should have been out of the first inning unscathed, but right fielder Steven Souza Jr. dropped a foul ball while Josh Donaldson was at the plate. Toronto’s third baseman took advantage of the opportunity by notching a single. Snell came back to retire the next two batters, but Troy Tulowitzki lined a three-run homer in the next at-bat. Snell surrendered two more runs in the second before Cash removed him from the game. Archer fanned nine Yankees’ batters on Friday, but also surrendered five earned runs on seven hits over six innings. Archer continues to endure the worst season of his career, and though he wasn’t necessarily bad, the Yankees chipped away at him over the span of his start. Perdomo is known for his sinker, and when it’s biting, he can be dominant. The 23 year old righty has racked up the highest ground-ball rate in the big leagues among pitchers with at least 90 innings of work. He, however, has struggled to maintain the pitch’s effectiveness once fatigue sets in. Aside from the above mentioned 95 mph offering, Perdomo mixes in an 84 mph slider with excellent depth; a 95 mph four-seam, worm killer fastball; and a hard 89 mph changeup. Here we are, a month plus into the season, and the everyday players in the Tampa Bay Rays lineup have racked up anywhere between 55 and 115 at-bats. While it is easy to look at a particular player’s batting average and conclude that he is performing at a certain level, be that good or bad, only one statistic offers a valid measurement at this point in the season — strikeout percentage, or K%. Allow me to expand on things. Strikeout percentage is a statistic based on total plate appearances. It can be used to make inferences about a player based on a certain sample size — in this case 60 plate appearances, when strikeout percentage tends to stabilize. To put things in perspective, beyond the watermark of 60 plate appearances, it is unlikely that a player’s strikeout percentage is based solely on random variation. It is, typically, the first statistic to be analyzed because of the incredibly small sample size needed to accrue information. Walk percentage follows, stabilizing at 120 plate appearances, while HR rate stabilizes at 170 plate appearances — so on and so forth. You can read an excellent article on statistics and sample size at Baseball Prospectus. The question begs, how are the everyday players on the Rays’ roster looking so far? Let’s take a look. Note: The chart above is meant to be used as an estimate. League-average strikeout rates vary on a year-by-year basis. Rays’ everyday players strikeout rates compared to their career numbers and season projections. The Good — Logan Forsythe, Evan Longoria, Kevin Kiermaier, David DeJesus. Aside from the acquisition of Brad Boxberger, Forsythe is showing why he too was an integral part of the deal involving Alex Torres. His walk rate is down, his batting average and BABIP are up, and his strikeout numbers are down. There’s not much to be disappointed in at the moment. Despite what the seeing eye test on Longoria might suggest, he is actually performing better than he has in every single season, with the exception of 2011. Though his RBI count is down, there are a lot of non-Longo factors why — lineup construct being one. 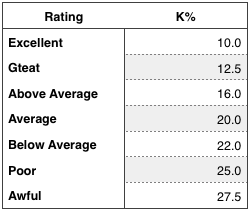 Kiermaier’s strikeout percentage is especially encouraging since he’s posted a lower rate while facing a LHP 30% of the time (vs. LHP 22% of the last season). The Bad — Steven Souza Jr., Asdrubal Cabrera, Brandon Guyer, Rene Rivera. To put it bluntly, opposing pitchers are exposing the holes in Souza’s swing. The rookie earned 37.3% K% by not protecting a large enough zone, and getting fooled badly in the times he does. He has shown the ability to learn and make adjustments. Here’s to hope he can continue to do that and lower that gaudy number. Cabrera was the big free-agent acquisition that Matt Silverman hung his hopes on. Unfortunately he hasn’t been the most productive player in the lineup. He’s striking out at a higher clip than ever before, and it isn’t uncommon to see him pop out into the more shallow parts of the field when he does make contact. This friends, isn’t good. Guyer’s 1.4% increase is negligible, especially over the small sample size. I’m not overly concerned. Beckham has shown what he can do when he makes good contact; his five extra base hits, nine runs, and 11 RBI in just 62 at-bats speak to that. However, he’s also been pretty over matched on more than one occasion, and will need to adjust to survive. To be clear, strikeout percentage (as with any statistic) is fluid and can change for better or worse. It can decrease when a batter makes the proper adjustments at the plate. Take former Ray Wil Myers for example. Myers lowered his below average 24.9% K% in 2014 to an average/above average 19.4% in San Diego. In the case of Forsythe, Longoria, Kiermaier and DeJesus, their decreased number of strikeouts have bolstered the lineup. However, in order for Souza, Beckham, and Cabrera to blossom into the players Silverman envisioned, those adjustments will need to be made. An aside, I’ll be writing a similar piece on walk percentage when the everyday players hit the 120 plate appearance plateau. On the season, Cash has allowed his starters to face the second-fewest number of batters a third or a fourth time. Only Buck Showalter’s Orioles starters have faced fewer batters a third or fourth time, and that is because they’ve pitched three fewer games on the season. The long-term concern is the workload the bullpen is taking on early this season, but Jake McGee will be back soon to at least offer some workload relief, but it would not be surprising to see Silverman and Cash keep the Delta Connection shuttle between RDU and TPA a bit busy this summer. It was refreshing to see Cash adjust his strategy after learning from the mistakes of a few days ago and not being married to a rigid process on a nightly basis. While the process of pulling pitchers on low pitch counts to avoid a third trip through the lineup may be frustrating to fans, it is tough to argue with the results. As the Rays take the field to host the Rangers, the starters have a combined 3.19 ERA to lead all of the American League. Compare that to the Baltimore starters whose staff ERA is 1.35 runs higher at 4.54. The Process Report is probably my favorite blog, and the rest of Collette’s piece deserves your attention! — Alex Cobb announced that he has decided to undergo Tommy John surgery. The announcement comes on the heels of his previous announcement Thursday, that he’d receive a couple of weeks worth of platelet-rich plasma (PRP) injections to see the effectiveness on what was believed to be a partially torn elbow ligament. The thing I keep hearing is people get the PRP and then it might put a Band-Aid on something for a little while, but I don’t think it really cures the underlying problem. So that’s obviously in the back of my mind, too. I felt like it’s probably the best decision to go ahead and get the surgery done. It’s a tough decision because you want to hold onto every last hope of being able to pitch this year and contribute, but I think not only for my own future but going into next season and contributing for the team next year, better not to waste any more time. Just go ahead and do it. It’s hard for me to believe that it wasn’t there the first time. That’s the tough part to realize that this happened March 17 and if we went a different route, maybe then we could’ve been back quicker on the end game (after surgery). He is scheduled to meet with Dr. James Andrews on Wednesday and will likely undergo season-ending surgery Thursday. The tentative return date is September 2016 so he can feel confident and comfortable heading into the 2017 season. I know the road I’m going on is a long road. That’s frustrating. I feel it’s the prime of my career age-wise, and I want to go out there and perform and pitch. The centerpiece of the James Shields/Wade Davis trade is headed to San Diego with Ryan Hanigan. The Rays — unexpectedly — just completed a three team trade of Wil Myers and Ryan Hanigan with the San Diego Padres and Washington Nationals. The deal is pending physicals of all the players involved, and final confirmation from the Rays. Per a tweet from Ken Rosenthal, SS Trea Turner (SD) and RHP Joe Ross (SD) are headed to the Nationals, OF Wil Myers (TB), C Ryan Hanigan (TB), and C Jose Castillo (TB) are headed to the Padres, and OF Steven Souza (WA), LHP Travis Ott (WA), C Rene Rivera (SD), RHP Burch Smith (SD), and 1B Jake Bauers (SD) are headed to the Rays*. (Players previous teams are in parenthesis) Overall, the Rays are netting five players for two big leaguers and a minor league prospect (Castillo) who, incidentally, received an honorable mention in Keith Law’s top-ten prospects piece last season. …Some combination of concern over his ability to reach his potential and a sense of maximizing his remaining value to restock their system with premium prospects led them to at least strongly consider doing just that, potentially continuing what has been an extensive remake of the roster under new baseball operations president Matt Silverman. …Teams always know their own players best, so if the Rays are willing to move Myers – as it certainly seems – there must be some questions, whether talent, health, work ethic, consistency, potential. Still, the three-team trade has its share of pitfalls. Minus the obvious — that Tampa Bay dealt the centerpiece of the James Shields/Wade Davis trade, and the catcher who was thought to be the Rays catcher of the near-future — Souza hasn’t quite passed the seeing-eye test, while there’s the question whether the 31 year-old Rivera (a career .228 BA/.279 OBP/.358 SLG/.587 OPS hitter) can repeat his big 2014 season. Without fully analyzing the deal**, this trade tends to leave an immediate bitter taste in the mouth. I can’t help but wonder how this will help the team in the here and now? The Rays, who were strapped for a backup catcher and a productive bat previous to Wednesday afternoon’s deal, are now potentially down a full-time catcher and two big bats. While the Silverman/Bloom/Neander brain-trust is doing what Friedman wouldn’t dare, there’s an impetuous anxiety inside revolving around one simple question: When will Silverman acquire players who will bolster the lineup? The elephant in the room begs to be acknowledged and answered. * The Rays may include a second minor leaguer. If so, Gerardo Reyes would go as well. ** Expect lots of analysis to follow.